Ma’rib is located to the east of a gorge in Jabal Balaq at the edge of the Sarawat Mountain range. It is perfectly positioned to receive the stream of water – collected by the extensive Wadi Dhana basin during the spring and summer monsoon – as it flows eastwards towards the hyper arid flatland below. It also benefits from the ground water aquifer fed by this stream. The people of Saba’ (Sheba), who made Ma’rib their capital since the 8th century BCE, were the first to capitalize on the environmental advantages afforded by this location – its surface water, its ground water, and its silty soil. They developed an irrigation network organized around two main canals to benefit from surface water and created a settlement organized around two farms that were largely aligned with the extents of the ground water aquifer below. These farms produced a range of products including dates, barley, grapes, and wheat. Yet the development of agriculture alone was not what created the great city of Ma’rib and the civilization of Saba’ (Sheba) which lasted for centuries. Ma’rib was also well located to benefit from the incense trade between the south of Arabia and the rest of the world. The lush oasis surrounded by sand dunes, mountains, and lava fields became a natural stop on the incense caravan routes which carried Frankincense from its main sources in the Dhofar and Shabwa regions before they were carried northwards towards Mecca, Medina, Petra, Gaza and onto Europe. Wealth accumulated through this trade allowed Ma’rib to build its 16 meter high dam – the oldest known dam in the world – which stored water, regulated water flow, and minimized flooding. The people of Saba’ also built an advanced irrigation network that supported as much as 4,000 acres of agriculture, and constructed temples whose ruins remain to our day. But Ma’rib’s trade advantages eventually came to an end. By the 1st century CE, the incense trade routes moved away from the use of caravans in favor of ships and barges though the Gulf of Aden and the Red Sea. This proved more economical and allowed for better integration into the maritime silk route between India and Europe. By the 2nd century CE, Ma’rib lost the status it had maintained for almost a millennium to the ports of Aden and Mocha who were better positioned to benefit from the new trade route and were part of the relatively new Kingdom of Himyar to its south west. Inevitably the people of Saba’ found themselves in conflict with the rising kingdom, before the Himyarites finally took control of Ma’rib in the 3rd century CE. The fall in demand for incense due to the rise of Christianity and Islam ultimately put an end to the incense trade route altogether. Yet the story of Ma’rib does not end there. Despite losing its wealth, the biological capacity of the city allowed it to revert to being an agricultural settlement, before its dam collapsed in the 6th century CE. When a new dam was built at the end of the twentieth century – just two miles upstream from the ruins of the historic dam, creating a reservoir that is Yemen’s only surface water body – the city made a comeback as an agricultural settlement. Today agriculture in Ma’rib not only provides for the livelihood of the local population, but it also represents 8% of agricultural production in Yemen. Unlike Ma’rib, many cities in our globalized world do not have the luxury of a fallback option. These cities – including many across the Middle East and North Africa – use the wealth acquired from trade in goods and services to compensate for their water scarcity, the low biological capacity of their immediate hinterland, or their extreme climates. This is sometimes supported by an abundance in alternative resources (e.g. energy) that are used as a substitute for the deficiencies above. Desalination and air conditioning, for example, are used to ‘manufacture’ freshwater and moderate indoor climates in the cities of the GCC and many cities across the south western United States. Even cities which lacked such alternative resources were undeterred, and some such as Singapore and Dubai have opted to leverage their location, their ports, and their integration into the global trade network to compensate for their low biological capacity, their lack of water, and their extreme climates. They are often hailed for their success in creating successful economies against all the odds, and their lack of built-in resilience is often defended by pointing to the growing trend of hinterland globalization and to rising global interdependence. But for such cities existential questions regarding their long term sustainability and resilience linger: Bereft of water and biological capacity to fall back on, what happens to these city if their trade networks were disrupted? To discuss this article or the infographic, please join Carboun’s discussion group on Linkedin. 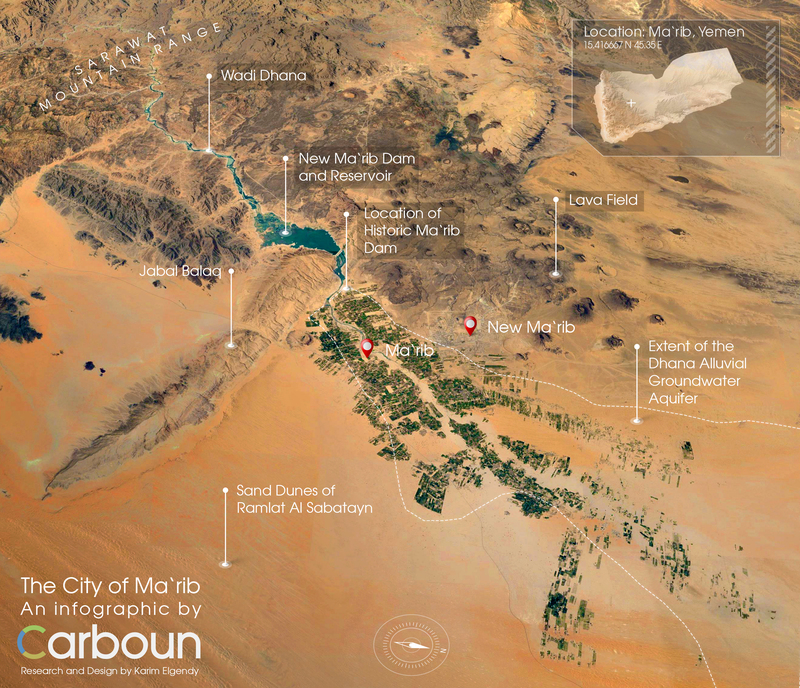 For news and updates on sustainability from around the region, follow Carboun’s Twitter feed.